Painting with acrylics is an excellent choice for a beginning painter. Acrylic paints use water as a thinning medium which makes them easy to clean up and easy to make transparent. Painters generally have lots of brushes and few pencils. Sketching often consists of just enough lines to guide your brush. A beginning painter should have several types of acrylic-specific brushes such as flat, round, thin and flared. Select larger brushes and just one or two small ones until you know how much detail work you will want to do. Brushes are really about the style of painter and the type of paintings that painter will want to produce. If you gravitate toward abstract style, then you may be attracted toward larger flat brushes. If you want to paint landscapes, you will have a few more rounded brushes. Acrylics can also be applied with palette knives. Again, select a general knife to start and purchase others as you develop a specific use for them. Because acrylics clean up with water, you can use old porcelain plates as palettes. Dried paint will even peel off when you are done. 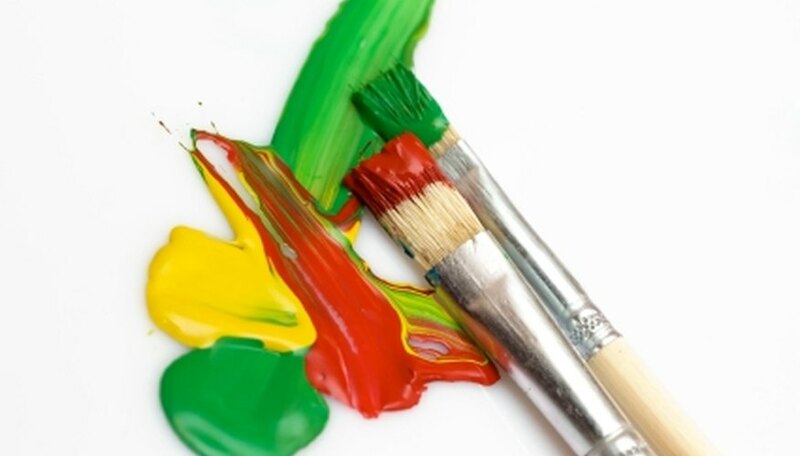 You will also need a water cup, paper towels, an easel, clamps, some preprimed canvas (boards are cheapest), gesso as needed, a water squirt bottle and paints. Select colors that you are attracted to. Some prepackaged kits will come with a color assortment; these are often on sale and can be a good buy. Keep in mind that paints can be pricey and, as a beginner, your objective is to explore and experiment and learn. As you paint you will buy what you need and develop the color range that suits you. Keep it wet. This means you spray your canvas while you apply your paint so that the paint takes longer to dry. This will allow you to create some blending and movement on your canvas. Thin is good. By thinning your paint on your palette you can use the paint to build up layers of color and intensity. Keep in mind that with acrylics you are working fast. By learning your paint colors, you will be able to quickly locate the right tube if you want to mix colors. Experiment. Thick is great. Acrylic can be applied quite thick to create interesting textural effects. Use your palette knife. Try things like combs to scrape off portions of still-wet paint. Tape it. When your paint is dry, use your tape to mask off areas and then paint a new painting as if the original paint weren't there. Let it dry and then remove the tape. Try a few of the fluid acrylic paints using a flow-improver medium instead of water, and then manipulate your canvas while the paint is moving to flow the paint across your surface without a brush or knife. This is messy, so paint in a mess-approved area. Paint wet on wet or wet on dry, each will give you different effects. Glue objects to your canvas with paint. Experiment with string, paper, netting, decorative objects like sequins and beads, gears from a watch; almost anything light can be applied to the canvas as part of the painting. The primary goal of a beginning painter is to give herself permission to create absolutely ghastly art and to be fine with it. Painting is both craft and art, and you learn by doing, by risking and by enjoying the process of discovery. One of the best features of acrylic painting is that this paint can be used on so many diverse surfaces using an endless variety of techniques. Apply a little gesso and allow your creativity to spill across the surfaces of your life.